First published in 2007, New Amsterdam by Elizabeth Bear is a steampunkish mystery series set in a world with an alternate history as a backdrop. The book is divided into vignettes or short stories where crimes are both committed and solved by the central characters. Spanning a period of time from 1899 to 1903, the six stories are linked and an overall story arc simultaneously developed to slowly reveal characters and give her worldbuilding depth. Known in Europe as the Great Detective, Sebastien de Ulloa is such an old creature that he no longer remembers his birth-name or even when or where he was born. After the woman who made him immortal chooses to burn rather than going on, Sebastien abandons his European "court" and emigrates to New Amsterdam with "courtier," friend and assistant, Jack Priest. Sebastien himself doesn't really have a reason to live, but between willful Jack, the pleasure found solving murders, and the people he meets in New Amsterdam, Sebastien slowly finds reasons not to take that last walk into the sunrise. Two of those reasons are DCI Abigail Irene Garrett and author Mrs. Phoebe Smith. Detective Crown Investigator Abigail Irene Garrett is a forensic sorceress in service to the British Empire in New Amsterdam. In a world where men rule, Abby Irene is scandalous, notorious, loyal and a woman to be reckoned with when it comes to seeking justice. Abby Irene is an aging beauty who had affairs with royalty and when Sebastien meets her, is having an affair with the married and powerful Richard, Duke of New Amsterdam. Of course that doesn't stop the hard drinking single-minded Abby Irene from becoming entangled with Sebastien, becoming a friend and eventually part of his "court." Bear is known for writing excellent fantasy and building her worlds around alternate history, so there is no surprise that in that respect she excels in this series. In this world, the British Empire takes New Amsterdam (New York/Manhattan) from the Dutch during the Napoleonic wars. The American colonies are restricted to a small area, as the Iroquois, with their magic, stopped the British from further expansion, and the Spanish and French conquered and kept other chunks of North America. And in the late 19th Century the Revolutionary War against the Crown is brewing. Magic and sorcery are very much accepted and part of the culture in both Europe and in the New World, while wampirs and their courts are accepted in sections of Europe and outlawed and persecuted in the New World. This is a moody, atmospheric world with richly developed characters. As a wampir or vampire, Sebastien comes off as unusually unique, although he is constructed more or less after the traditional vampire. He's an immortal fighting time and history after surviving centuries by adjusting to changes and not growing too attached to mortals, or at least that's what he claims. He knits! And gentleness and warmth accompany coldness. Yes, Sebastien is different, and the logistics of how his relationships with his mortal court work are also different and unexpected. Abby Irene is a force! A relentlessly strong woman unwilling to show vulnerability to men or to compromise her beliefs. There are contrasts and similarities between Abby Irene and Phoebe who comes off as softer, but is just as strong and single-minded as Abby Irene. Oh and Jack! Lovely, loving Jack who at a young age has lived a lifetime. Titles of stories in New Amsterdam: Lucifugous, Wax, Wane, Limerent, Chatoyant, Lumere. The mysteries/crimes are excellent although my favorite stories are the first three, Lucifugous which takes place in the dirigible while Sebastien and Jack are on their way to New Amsterdam, Wax and Wane taking place in New Amsterdam, and Lumere set in Paris oozes atmosphere. Highly recommended. Released in March 2009, Seven for a Secret is the original sequel to New Amsterdam. However, if you read the series in chronological order, by events taking place, I believe that The White City should really be that sequel. Seven for a Secret is one short story featuring a rather morose Sebastien who knows he will be losing his beloved friends to age and death soon; an old, frustrated, but still sharp Abby Irene, and of course Phoebe. It is 1938 and Sebastien de Ulloa returns to London so that Abby Irene may die in her homeland, but they return to a Britain conquered by the Prussians where the Chancellor's army occupies and rules. Ironically, England's new King Phillip is exiled in New Amsterdam. Abby Irene won't have it, and Sebastien will do whatever it takes to make her happy. Central to this story are two young girls in love, Ruth and Adele. One lonely evening Sebastien follows two girls and although he saves them from a local policeman after witnessing their sweet kiss, something about them smells wrong. What he finds is the Chancellor's terrible plan to use Ruth, Adele, and a school of girls as his own personal secret weapon. I liked this very short story, however, I don't recommend it be read on it's own as I don't believe the main characters would be understood or well-appreciated. Sebastien is quite philosophical about time and loss, Abby Irene can't perform her sorcery and Phoebe is in the background so this is a slower kind of story. The girls, Ruth in particular, are intriguing and I like how Bear incorporated the plight of the Jewish people through Ruth's character and how well she incorporated alternate history. However, Bear's focus on the effects of time, loss and aging affected me -- a nostalgic read. As a side note, I find the cover of this novella disturbing, even as I admit that it fits the story quite well. Recommended. 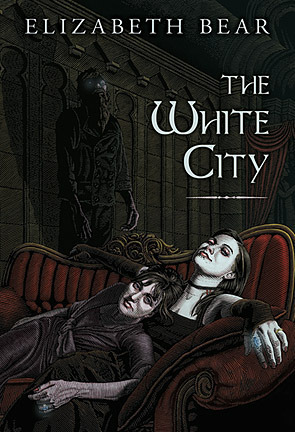 Speaking of covers, I love the cover for The White City (December 31, 2010) and this was the first of the three stories I purchased because it called to me. I read the series in chronological order of events and read this book after I finished New Amsterdam. The series really flows better that way in my opinion. The White City is set in Moscow and believe me the setting is gorgeous! After the events that chased Sebastien and his court from New Amsterdam and the terrible loss experienced in Paris, he decides to move on to Moscow to bring an old acquaintance some sad news. Instead what he finds when he arrives at Irina Stephanova's studio is a murder. Soon, Sebastien, Abby Irene and Phoebe are embroiled in a crime investigation. 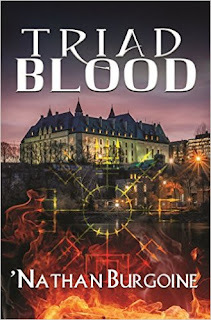 But quickly Sebastien realizes that this murder is somehow connected to another murder that took place the last time he and Jack were in Moscow, a murder that also involved Irina Stephanova. I loved New Amsterdam, but this has to be my favorite of the three books. It features two parallel mystery murder investigations and/or stories, one led by Jack and Sebastien, and the other by Sebastien and Abby Irene, both beautifully worked and weaved into one by the end. The characters, setting and atmosphere in this story are rich and well.. gorgeous. I loved the mood, the revelations that came from and about all the characters, and particularly about the wampier culture. The White City made me want more stories about Don Sebastien de Ulloa and more of Elizabeth Bear's writing. Highly recommended. That's the meat of this series, although I understand that Ad Eternum was written as an epilogue, a 90 page short story featuring Sebastien's return to New Amsterdam in 1962. I don't have it and don't intend to read it. I'm sure you have one question: how is this steampunk? Well, we can begin with the fact that in 1862 our characters travel from Europe to New Amsterdam in a hydrogen fueled dirigible and go from there. The steampunk details are subtle and don't overwhelm or take away from the rich characterization, the mystery murder investigations, or the alternate history details and fantastic atmosphere that make this series stand out. NOTE: All three of these books are out of print but available in ebook format for eReaders for $2.99 each. Orannia, these are short and relatively quick reads. New Amsterdam is the longest book and it is divided into 6 short stories which makes it go fast. If you're in the mood for some good murder mysteries with a great setting and excellent characters then I recommend them. It's interesting that they are all short stories, I don't think I have ever read anything like that except for those Edgar Allan Poe that are kind of linked, with the detectivesque guy? I don't know. I read them for school. Anyway, It sounds interesting and different but kind of the thing you need to be in the mood for. Sounds very interesting, Hils! And I'm glad you enjoyed yourself so much! Hello Hilcia..you keep grading this author's books with an "A"...impressive. Would you say this is one of your favorite authors ever? Genres aside? Ohhh, that's interesting. In looking back, I believe this is only the second A I've given Elizabeth Bear's work, but I AM always very enthusiastic about her books even when they are Bs. That is quite true! I do love her writing and am always impressed by how well she writes fantasy, and how well she weaves it in with other genres: mythology, history, science fiction, and now murder mystery. Plus, I love her gender bending characters and excellent characterization. I recently tried my first Elizabeth Bear, Range of Ghosts. I liked it (especially the world building) but I kept getting distracted and ended up having to return it to the library before finishing it. These sound very interesting though and like something I would really enjoy. I love all the elements and since it comes highly recommended, these may be for me. I'll look into downloading the first one and go from there. Brie, these books are great because the short formats make them quick reads and the price for ebooks also make them accessible. But, the blend of genres made them perfect reads for me at this time. I hope you enjoy these more than Range of Ghosts. 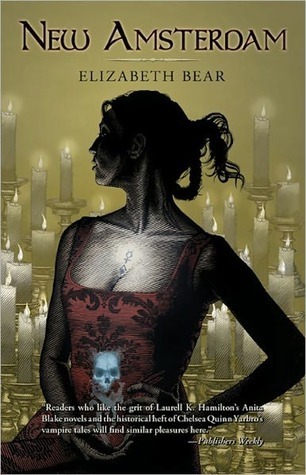 And FYI, Range of Ghosts has to be the single most traditional fantasy book that I've read by Bear so far. It's too bad you couldn't finish it. These sound very good but that cover for Seven For A Secret is downright creepy!